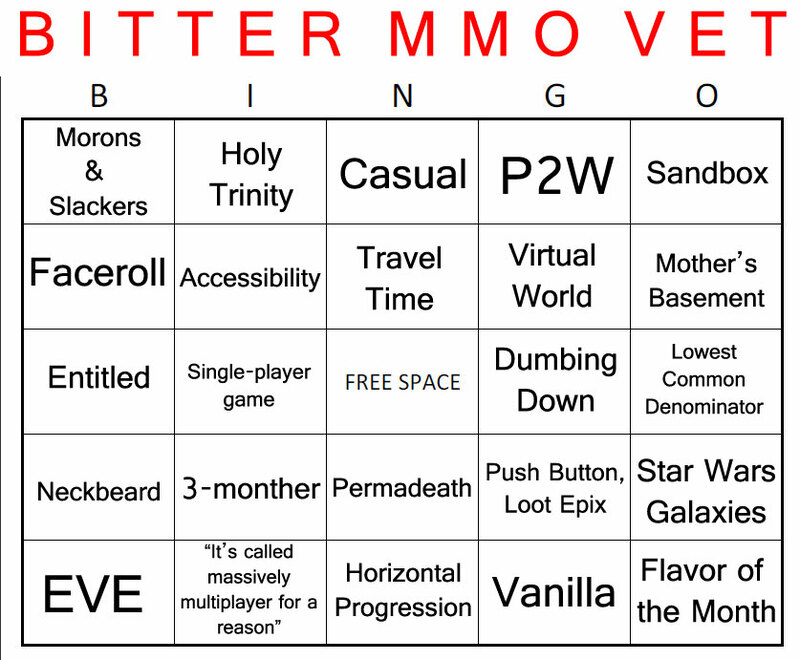 Which, along with the Free Space, is a full Bitter MMO Vet Bingo. Special thanks to Keen, SynCaine, Tobold, and their commenters for the inspiration. The fig leaf proffered is that perhaps everyone can make all the basic recipes, but that only specialists can make the best items. However, the whole notion is ridiculous, for a number of reasons. First, you cannot “force” specialization in any game that allows alts. It wasn’t even much of a commitment on my part to develop a full stable of crafting alts in WoW because I wanted the ability to switch up my endgame play-style anyway. Even if you imagine that your perfect MMO limited you solely to one character per account, people could bypass the restriction via multiple accounts. That is, after all, exactly what EVE players do when they circumnavigate the restrictions of real-time skill gains (itself a way of forcing specialization). I suppose on the plus side, this makes your subscriber numbers look pretty peachy. Second, you don’t actually need mutually-exclusive specializations in order to have a robust economy, as Keen claims. Within the beginning chapters of every Economics 101 textbook is an explanation of comparative advantage. The simple version is that two villages can produce both rice and fish, but at differing ratios: Island A can produce 10 units of rice or 5 units of fish in a day, and Island B can produce 10 units of fish or 5 units of rice. The ideal proposition is for Island A to produce rice, Island B to produce fish, and then trade half for half with one another, leaving both the richer for it. In fact, an economy between the two islands works even if Island A can produce everything more efficiently than Island B. Or, perhaps more simply put, there is an opportunity cost to every action, regardless of whether or not you can do everything yourself. Any in-game economy will continue humming at full speed as long as one person is willing to mine ore and another more willing to farm gold than ore. Even though I could make everything myself in WoW, I still bought huge sums of materials and even finished goods because it was faster than doing it myself. Indeed, the existence of an AH at all will typically create entire economies by itself (barring ghost town populations). Finally, there is a curious sort of bluntness to the dispassionate thought that people need to be forced to interact with one another via extreme limitations. Don’t get me wrong, I am someone who is thoroughly behind the idea of Divine Trinity and other forms of implicit specialization. But I feel like these sort of roles should be arrived at organically, rather than at the character select screen. I am a tank because I enjoy being a tank, not because I happened to pick “Paladin” in 2008. If I had stuck with Warlock, my first WoW character, how much less value would I have brought to the game, to the friends I made, and to my own game experience? As WoW has proven time and again, and even in the largely role-less GW2, just because everyone can be a tank (or tank-like), doesn’t mean they are willing to step into that role. So what possible good can come from shackling a potential tank to a dreary DPS-only experience? “So specialization matters”? Further, the days in which I am inclined to make new friends out of perfect virtual strangers is largely in the past, and no amount of cumbersome game mechanics will get me back to that place. Even if extreme specialization is for the next generation of MMO player’s sake, I’m rather skeptical that such methods would at all work out the way people imagine they would. As Tobold recently pointed out, our generation of gamers were playing MMOs before the advent of Facebook and other social media – our games were our social media, our place to meet like-minded individuals. MMOs these days are 3-monthers not because they lack in content or design, but because we’re unwilling or unable to invest the social capital necessary to maintain our interest. And why would we? Either we brought along all the friends we already have, or they didn’t make the jump with us. In both cases, we’re full-up on social interaction, thanks. So, essentially, I say let people do what they want, and they will sort themselves out according to their predilections. Posted on January 27, 2014, in Philosophy and tagged Economy, Game Design, Holy Trinity, Pro-Social, Specialization. Bookmark the permalink. 16 Comments. I think Keen often uses “xenophobe” when he means “misanthrope”. That aside, whichever side of this debate you stand on I think the boat has sailed. We are heading towards a multiplicity of niche MMOs with small populations, which may have any number of rulesets, and a much smaller number of large-scale, popular MMOs, whose makers will be concerned primarily with maximizing their income streams. For the large games, preventing people from doing anything that results in them spending more money will not be an option so specialization will be out and generalism in. EQNext is very definitely aimed at the “popular” end of that spectrum, and it’s F2P, meaning no inevitable benefit to SOE from multiple accounts, so I would be very surprised to see SOE limiting access to content they can monetize. You may not be able to be everything on a single character in Landmark or Next but I bet you will be able to be everything on a single account. The upside should be that in a few years there should a least be one or two MMOs that roughly suit most playstyles. Or so we can hope. I haven’t really looked into it, but are these niche MMOs actually sustaining themselves? I mean, we heard the recent news about SOE shutting down four of them, but I’m not even sure what other niche MMOs are out there. Maybe titles like APB count? I’m all for companies supplying a given niche – lord knows JRPGs were exactly in the same situation a few decades ago – although it seems like the MMO genre itself is not as conducive to the “indie” style as all the others. Then again, I suppose things like Kingdom of Loathing is still around so who knows? If I understand you correctly, even if players are allowed to have all the available professions they will still trade (hence socialise) with each other due to opportunity costs? If yes, I agree but the problem is that most MMO don’t have many/varied opportunity costs. In your island example, island A (an efficient producer) will only trade with island B since they have better things to do than produce rice and fish. So in MMO case, since the opportunity cost is low, players have less incentive to trade with each other hence socialise. However I guess this is what you like in an MMO? Since you don’t like to interact with strangers in a MMO these days? The fundamental opportunity cost in every MMO is time. Just because you can farm all your own mats, doesn’t mean that you should, especially when someone else is willing to do it for less than you’d make spending that time farming dungeons or whatever. You don’t actually need any harsher opportunity cost than that to get trade to occur. Look at GW2. It’s not a perfect example – there’s a money cost in switching professions, and the economy is a bit weird given the incentives to mass-produce junk – but it proves you don’t need hard-coded specialization to foster trade/ socialization. Or, you know, EVE is another example. @Azuriel – I too agree that you don’t need hard-coded specialization to foster trade/ socialization. it should (and can) take place naturally. If you are hard coding it, then it means you have failed somewhere else and this is a band aid fix. The bigger point is that socialization doesn’t just happen on its own, it needs reasons. So in a MMO needs systems or mechanism for these reason to arise. Keen’s solution is hard-coded specialization which doesn’t work very well. Another system is where you can level all the profession you want but it takes lot of time to level each profession so realistically a person can only have one or two professions. Do you consider this a forced socialization ? I have less of an issue with the “time-based specialization” design, although it is easily circumvented with alts/multiple accounts. As for socialization not happening on its own… er. Were you forced to socialize with all the friends you made IRL? I find it more likely that you happened to be in the same general location, perhaps doing similar things, and interested in (or at least open to) making friends. Conversely, group projects were the absolute last place to make friends for me, as it mostly made strangers liabilities first, and people second. I will admit, however, that I originally joined Invictus (and thus met the guildies that I still talk to today) via a Scarlet Monastery run. I just don’t think it was necessary, especially if we had other social tools in which to find likeminded individuals. When I said, it takes lot of time to level up I didn’t mean, offline level up like EVE. I mean craft million items to level system etc so you can’t circumvent without botting etc. At least in my experience, Just being in the same location, doing similar things does not make socialisation happen on its own. Its needs nudge and a push! Take a MMO example, you are in an area with few other people and all of you are killing the same mob. Do you think any of them will speak to you? Unfortunately in my experience, no one will…. maybe I stink! I think you mean olive branch not fig leaf, though that is an entertaining mental image. Actually… fig leaf works too. You’re correct that I was thinking about olive branch though. The complaint is odd…we shouldn’t have all the professions because of socialization, but who in the world ever socialized because of needing a gem or an enchant? I guess in the rare case you might make a friend who is a reliable supplier of x ingredient you need, but the vast majority of transactions in MMOs happen in some impersonal, automated marketplace like WoW AH. Trade spam is about as far as it gets for interaction these days. Is the act of going to an AH and buying something supposed to represent some crucial element of socializing? I do think that specialization in professions does add some verisimilitude. It would be strange if you could simultaneously become a master blacksmith, enchanter, leatherworker, etc because in the real world these things (well aside from phony ones like enchanting and alchemy) take years to master. Even in EVE, which has become for some like a Platonic ideal of MMOs rather than an actual game they have fun with, you can’t realistically learn all the crafting skills because there are just too many skill levels and not enough time. I think Keen often uses “xenophobe” when he means “misanthrope”. Ah, that does make more sense. On the other hand, isn’t it a bit unrealistic that I could be a master leatherworker and tailor, but be unable to learn anything about picking herbs? Couldn’t I learn enough to at least go pick some? I suppose that falls under Keen’s compromise, but I feel like a system like EVE’s or even GW2 where it’s possible to have everything (given time) but unlikely to be efficient to do it all yourself is the best. Well, on picking herbs specifically, I think it’s about time WoW just allowed everyone to have all the gathering professions. For crafting, you could do it the compromise way, but the game would have to be structured to make it sensible. In most PVE MMOs there is no use for lower level equipment, so the inability to make the best would effectively render the compromise moot. I’ll give EVE credit here for avoiding that one. @Matt – in older MMOs I have made friends with crafters. In those games its very hard to level up even a single profession so you didn’t have many craters to begin with. So those who can craft charged lot of money on AH so its lot cheaper to make friends with a crafter rather than go to AH. If it was very easy to level up professions, then you will have lot of crafters and cheap prices in AH (for example GW2) meaning no need to talk to your crafter and hence one less reason to socialise. I think you’re conflating “socialization doesn’t happen on its own” with “forced”. Social bonds are not formed by mere physical proximity, but by sharing experiences. So I may not be friends with Network Guy who sits 5 feet away from me because I never interact with him. But I’m great friends with Designer X who is on a different floor because we’ve done lots of projects together and oh man remember the time the client said yadda yadda and we were all stunned? That was good times. I’m someone who is always game to make a new friend, and in my life I find shared experiences (like grouping in MMOs, ha ha) is by far the way to meet people and grow relationships. Sometimes in games you need to manufacture those experiences for people to share. Heh. I always see this stuff and while I get where it’s going I think a lot of us would be better off asking for devs to add challenge back to the world rather than backload it all into raids. A huge issue with many of these features being asked for is that while they work well socially for folks who play at release within six months they always become an unclimbable slope for anyone just entering the game. No one ends up having time to help the level 30 dude getting through his group gated content. The old school book of MMO design actually tended to penalize helping out people who were below the curve. If anything I feel like GW2 did a fantastic job of evaluating the current state of MMO players and coming up with systems that do encourage socialization. In GW2 there really are no penalties for helping out strangers and since most things could be dealt with solo (but easier with a group) I found that talking to people and having interactions with them was much easier as I was never seen as a barrier to their own individual goals. What I do think people are actually looking for with these suggestions is camaraderie in the face of adversity. I’m currently playing dark souls which has a ton of mechanics that old school MMO players tend to like to eschew (group finding with strangers, no hot bar action based combat, classless leveling). What I am finding is that it has an online community that is much more civil than any MMO community I have seen in years. I think a lot of that is that people really do tend to band together in the face of a challenge more than they do because there is enforced group gating. As much as I enjoy the many moments when you and I passionately disagree, our agreement (as is the case to day) is like unrequited love when it happens. Great write up and I couldn’t have written the case better myself.